This is a story about an oak log, a bag of shiitake mushroom spores, and two women over three years. It’s also about hope and growth and joy and surprise. But most of all, this is a story about friendship. “There’s always hope, Julia!” My friend E stood jubilantly on my porch, clutching the 4-foot long oak log. I knew exactly what it was. Three years ago to the month, almost to the day, E and I took a road trip to a mushroom farm, about an hour from where we live, to buy shiitake mushroom spores. And a few days before that, E called and asked me what I know about growing shiitake mushrooms (“nothing”), and more importantly, was I interested in a joint venture of growing shiitake mushrooms together (“yes!”). At the mushroom farm, we bought a ziplock bag full of small plugs that had been dusted with shiitake spores. These delicate plugs sat in the backseat of my friend E’s car as we wended our way home down the Maine coast. In the backseat of the car, on a hot May afternoon—way hotter than the early season would suggest—the mushroom spores sat while we drove and while we went out for a nice lunch in beautiful coastal Damariscotta. And while we were at lunch, the bag got all condensed and mushy and cloudy and moldy looking. When we got back to the car, we looked first at the bag and then at each other, remembering that neither one of us brought the recommended cooler we both meant to bring along. “Maybe we should’ve taken them to lunch with us.” E suggested. I nodded my head, thinking she was probably right and wondering if there was any hope we’d ever get any mushrooms. I know E was thinking the very same thing. On the way home, we planned. The next Saturday would be mushroom planting day. It sounded like a longish process, this shiitake mushroom planting, and we knew that we would be enlisting the help of MEH (My Engineer Husband) and E’s husband M. The mushrooms would grow at E’s house—because she had a lot more land and also a very shady area (shiitakes need that) under some pine trees. We lamented the fact that I didn’t live next door—because if I did, we joked, we would start a business called Mushrooms in the Middle. And the mushrooms would live between our two houses. “Let’s wait and see, Julia.” In that matter-of-fact tone she always uses when I dream big and get way ahead of myself like I do about almost everything in my life. Anyway, E dropped me and the spores off at my house. To be honest, I can’t remember if we really talked about this, but I remember thinking to myself that if E got custody of the mushroom babies (yes we did call them that) for most of their lives, then I could at least take care of the babies for a few days. Which, as it turns out, was not a simple process. Without writing an instruction manual for planting shiitake mushrooms (although I probably could write a better one than the one we used), it involves many large (6-8 inch in diameter) oak logs, a drill, paraffin wax, a mallet, LOTS of water to soak the logs in, and something to prop the logs up on. Thank goodness M, E’s husband, has a big pick-up truck that he was willing to use to haul freshly cut oak logs. On that Saturday morning, MEH and I were supposed to go along to get the logs—we were going to meet M and E at the wood farm (I think it’s called a woodlot, actually), but we got lost on the way to the hard-to-find place, and we gave up (okay, it’s embarrassing, but that’s really what happened!). Instead, after a few attempts via cell phone to locate the place (we failed), we instead met up with E and M at their house. It was a little quiet for a while, because I think we were all a little grumpy: E and M because they had to do the job alone, loading the logs, and MEH and me because we were pretty embarrassed and frustrated that we never found the woodlot. Anyway, we had the logs, and we drilled holes in them—a LOT of holes all over each of about 15 logs. Then we pounded the little spore plugs into them, then we covered each of the little plugs with melted wax. Then we soaked the logs in water. Or at least that’s the order I think we went in….what I really remember is that it was a long, long, LONG process. And we had several points of discussion. For instance, whether the logs were really freshly cut (we decided they weren’t) and whether we soaked the logs before or after drilling the holes (I don’t remember what we decided or even what we did) and whether we really had to cover the spore plugs with paraffin (we disagreed about this, E and I), and how hard we should pound the plugs in or whether we should drill bigger holes. Did I mention there were FOUR of us making these decisions together? And during each of these brief decision points, we would look at each other, E and I, and realize even though we were in charge, we were far from shiitake mushroom growing experts. And did I mention that it was hot and we were tired and grumpy? Finally, we weren’t so careful about anything, maybe even including each other, and we rushed to get done. “I think that’s good enough,” said E.
“Maybe we should’ve gotten fresher logs,” E mused out loud. And we both nodded our heads—and I wondered if there was any hope that we would ever get any mushrooms. I think E was thinking the very same thing. Still, we finished, although not to our complete satisfaction, any of us, because in the end we all made compromises we maybe wish we hadn’t. Then, we put the logs away, and MEH and I went home. And all my thoughts of Oprah, and the Today Show, and even of being an entrepreneur at the farmer’s market and maybe even having a shiitake feast, and, yes, even getting one shiitake mushroom, had pretty much been dashed by then. The big announcement was that E and M were moving to a new place—about two hours away, to a beautiful coastal village. Of course I was sad, no question. But what about the mushrooms? Believe it or not, it came up because the biggest part of the announcement was that they were selling THEIR house and OUR mushroom logs. And if that had happened, this would’ve been the end of the story because it was already two years after we planted them, and there were still no mushrooms. Neither E nor I really believed we would ever get any, ever. 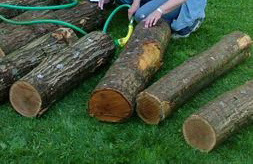 We talked about moving the logs, but MEH and I really didn’t have a place to put the logs at our house, and even if we did we might not have taken them because no one wanted to lug those 15 or 16 logs, covered with bugs and who knows what else, in the back of a pick-up truck! But it’s not the end of the story because even after E and M moved, and more time went by and E and M couldn’t sell their house because of the bad economy (that was bad), their daughter decided to live in the house while she became a teacher (that was good). But by then, when I heard this news, I didn’t give the mushrooms a second thought, and I doubt E did either. We were just thinking about the house and E’s daughter. And then more time went by, another whole year in fact. And all this time, now three years since the planting, E and I shared our personal joys and triumphs and tribulations as friends do—her mom’s and my brother’s deaths, our good-byes when she moved to her new-old house and the enjoyment of both our gardens and her ordeal with not being able to find her well (they eventually found it), both of our indecisions and decisions about career changes, joys and worries and achievements of our kids, her husband’s very-successful new business, and my husband losing his job, not to mention countless cups of coffee and lunches, and rainstorms and snowstorms, and horrible heat waves with visits to her new house and the beaches nearby. you’ll ever hope to see! And then one day, two days ago, I was sitting and writing my blog at my desk, and I saw a car pull into the driveway. Then I heard MEH talking to someone on the porch. And I ran out, and there standing on the porch was my friend E, who had driven two hours in a fancy concert-going outfit to see a friend in a farewell concert and on the way there dropped by her old house to visit her daughter. And in her fancy concert-going outfit, on a whim decided to look at the mushroom logs, which she hadn’t done in a about a year or more. And there, on the log, now cradled in E’s arms, against her very bosom in her lovely concert-going outfit, were TWO SHIITAKE MUSHROOMS!! And both of us stood there, with tears in our eyes, and we marveled at the two small beautiful mushrooms on the log before us. And I knew E was right: you never can give up on hope! What joys and hopes and adventures have you shared with your friends? Do friends enrich you as a writer, like they do me? Cool story. You are fortunate to have a friend like E. I’m curious now. Did the mushrooms keep coming, or were those two the only ones? How weird that it took them all those years to grow! Alexandra, Thanks for the comment. I feel VERY fortunate to have a friend like E. So far, only the two mushrooms — this just happened last weekend! It IS so weird, isn’t it? Julia: You just made me cry! So cliche (I suppose for a reason) but hope truly does spring eternal. Great story of endurance and reward. Thank you for sharing! Lisa! Glad you enjoyed my story, and sorry you cried — although I’m also happy you cried because it means you felt the feelings I hoped readers would feel. Honestly, I cried as I wrote it, too. Thanks for the visit to my blog and for your lovely comment! Oh my, Julia. This was simply BEAUTIFUL. What a wonderful, wonderful message (especially to writers on the road to publication). The writing is brilliant; the symbolism is subtle throughout, but the message is so clear. As I scrolled through the story, I SO wanted to see an updated photo of a log WITH mushrooms on it. And I did! What a wonderful surprise. There IS always hope. And the other message is that patience is the key to getting the things we want in life. Lovely story, Julia! I’m so impressed that you planted mushrooms. I love the picture with the two shiitakes growing on the log. What meal did you and/or E make with them? I just wrote an essay about my relationship with my best friend, so yes, my friends definitely influence what I write about too. This is a wonderful metaphor for not being afraid to dream, but also that sometimes you have let those dreams alone for a time as they bring themselves to life. Congratulations on your success, and thank you for sharing this story. Okay, first off, I want you for my neighbor, Julia. You are FUN! And funny. I laughed outloud reading this. Secondly, this is good enough to sell to a magazine. Beautiful writing. Such a touching, inspiring story, Julia! I’d been thinking a lot about hope last night and this morning, and now I log on and realize your post sums it up perfectly. We really do need to step away sometimes, and let life work its magic instead of forcing things. What a great metaphor–for friendship, for writing, and for life. Thanks for sharing! Now, we all know “polishing” at this stage more resembles ripping out the seams and putting it back together again, but she grits her teeth and does the work, and the story she comes up with is miles better than the original. She shops it around, and it sells, after years and years of nothing. I’ve got a story that’s currently resting in its own freshly cut log, just like your shitake plugs. I want to finish it, but this isn’t the right time. Someday though, I’ll look at that log and see signs of life, and I’ll know I’m ready to give it another try. What a great story and what a wild thing to do from the beginning. Christine, Thanks! Yes, it was a pretty wild thing to do–certainly one of the most unusual things I’ve ever planted!